*all racers departing the Angel Rocks Trailhead by 6:30 p.m. will be allowed to finish the race. A brief mandatory pre-race meeting will be held for both racers. The 50 miler briefing will be held 20 minutes prior to the 5 a.m. race start at the Twin Bears Camp located at Mile 30 Chena Hot Springs Rd. The 50k briefing will be held 30 minutes prior to the 9:00 a.m. race start time at the Angel Rocks Trailhead located at Mile 49 Chena Hot Springs Rd. Participants in both races will be familiarized with the race course, the hazards on the course, race rules and cutoff time, recreation area rules and trail etiquette, the safety plan, and any other details necessary for a safe and successful event. Runners in both racers must depart Angel Rocks Trailhead by 6:30 p.m. race day. For the 50 mile distance this allows for approximately 19 minute per mile average pace (over an 8 hour marathon pace) for racers. All racers departing the Angel Rocks Trailhead by 6:30 p.m. race day will be allowed to finish. Adhere to the qualifying race and gear requirements. Be courteous to all volunteers, racers, and others recreating in the area. The Angel Creek 50 Miler is a difficult course that may challenge even the most experienced ultra runner. For this reason racers must have completed any foot race of marathon distance or longer within the past two years prior to registering for the race. It is highly recommended, though not a requirement, that racers have completed a trail run of at least half-marathon distance or longer within the past two years. There is no qualifying race for the 50K race. A wind breaker or rain jacket. Moose, Black Bear, and Grizzly Bears are found throughout Interior Alaska including the Chena River Recreation Area. Please use caution while traveling through areas with thick brush and vegetation where visibility is limited and wildlife may be surprised by your presence. Make noise while traveling through these areas and travel in groups if possible. If moose are encountered back away slowly and provide a path for the moose to escape. Moose are known for erratic behavior if they feel cornered or trapped. If a black bear or grizzly bear is encountered do not run away. Stand your ground and talk calmly to the bear. While carrying bear spray is recommended, it is not required. If you do decide to carry bear spray please be safe and familiarize yourself with its operation. Please report any bear or moose sightings or encounters to race volunteers. The following rules and information for racers and crew apply to both the 50 Milers and 50K races. Due to the remote nature of the course support crews will only be allowed within a 100 yards of the Angel Rocks Trailhead and pacers will only be allowed to park at the Angel Rocks Trailhead and Chena Hot Springs Resort. From Angel Rocks Trailhead pacers may wait for their runner or travel in the opposite direction from the checkpoint to meet their racer. 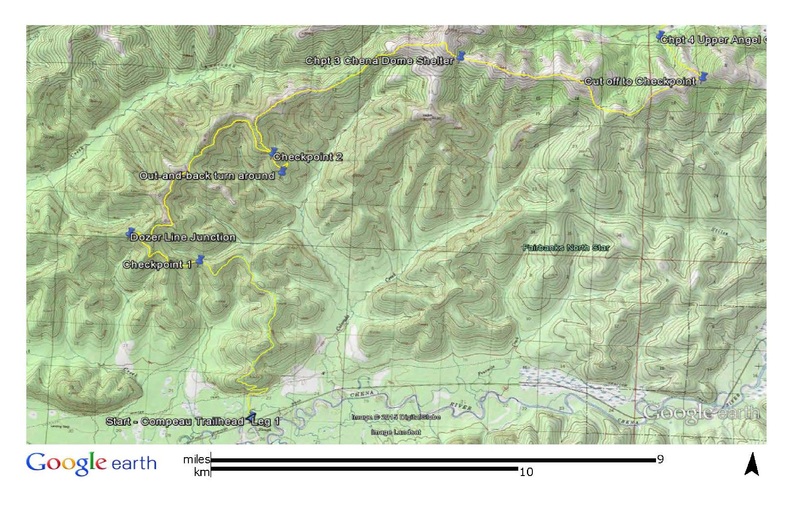 Pacers may travel as far back as the Upper Angel Creek Cabin to meet their racer. Pacers may also park at Chena Hot Springs Resort and travel in the opposite direction on the course to meet their racer. Up to two pacers per racer will be allowed. Pacers are not allowed on bikes, ATV’s, or any other mechanized or motorized vehicle. Drops bags will be available to runners in the 50 Miler at three locations: Upper Angel Creek Cabin (race mile 30), Angel Rocks Trailhead (race mile 42), and the finish line at Chena Hot Springs Resort (race mile 50). Drop bags for 50K runners will only be available at Angel Rocks Trailhead and the finish at Chena Hot Springs. Please bring drop bags to the start line clearly marked with your full name and checkpoint destination. A shuttle service provided by the race will transport runners in both racers from Chena Hot Springs Resort to the Twin Bears Camp (race start) the evening before the race and the morning of the race. Shuttle buses or vans will be departing Chena Hot Springs Resort at approximately 6:30pm the day before the race and 3:45am the day of the race. Spectators and support crews for racers are encouraged to park at the Angel Rocks Trailhead and/or Chena Hot Springs Resort. There is a $5 daily Alaska State Parks and Recreation parking fee at Angel Rocks Trailhead. Campsites and cabins will be available at Twin Bears Camp on a first come basis. Runners in both races are welcome to join us. There are 13 rustic frame cabins and plenty of tent camping spaces. Racers as well as pacers, support crews, spectators, etc. are all welcome. Outhouses and a bathhouse will be available. There are no fees for staying at Twin Bears Camp! We only have the camp reserved for Friday evening through mid-day Saturday so other accommodations will need to be made for Saturday night. Pacers, supports crews, spectators, etc. 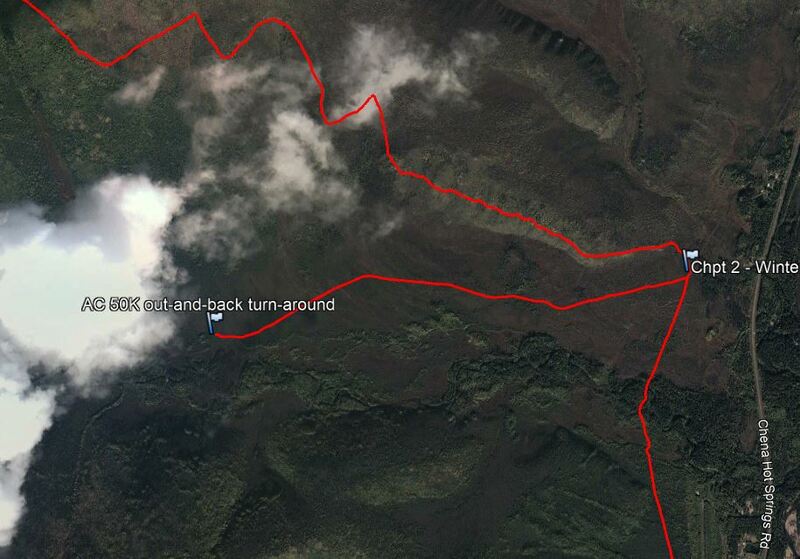 joining us will need to depart Twin Bears Camp by 10am the day of the race. Chena Hot Springs Resort also has rooms and campsites available. Contact the Hot Springs for more details (907) 451-8104. Road accessible cabins are also available for rent online through in the Chena River State Recreation Area http://dnr.alaska.gov/parks/cabins/north. Campsites at multiple camp grounds along Chena Hot Springs Rd. are available for a small fee and free tent camping is always available on gravel bars along the Chena River. A post-race party and BBQ will immediately follow the race starting around 5:30pm near the finish line at Chena Hot Springs Resort. We hope all racers, volunteers, family and friends will attend! Please head to the Hot Springs after the race for a soak and BBQ. The race course will be marked primarily by bright flagging. Pin flags of an identical bright color will also be used. In areas where the course is above tree line wooden lath with directional arrows will be used. Flagging and signs will be placed at trail junctions to guide racers in the right direction. Error: map could not be loaded - a map with ID 5 does not exist. Please contact the site owner. The race will begin at the Twin Bears Camp at Mile 30.0 Chena Hot Springs Road and follow the Compeau Trail approximately 16.0 miles. The first checkpoint will be at approximate race mile 7.5, half way between the start line and the second checkpoint on the Compeau Trail. 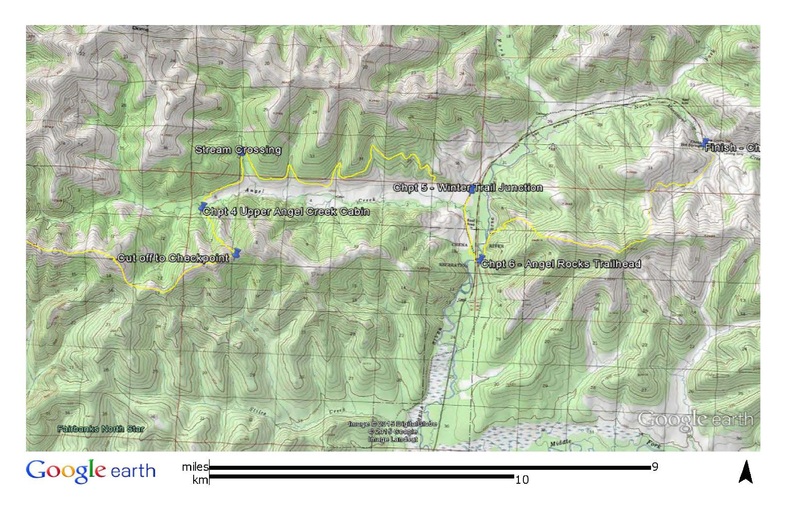 A short out-and-back will take runners mid-way down to the Colorado Creek Cabin. Departing Checkpoint 2 the course will climb back up the ridge to the Little Chena Dozer Line and traveling northeast traverse the ridge to the Chena Dome Trail. This section of the course is not maintained by Alaska State Parks, though a path does exist from a dozer line. Extra flagging will be used in this section of the course. Traveling east along the Chena Dome Trail the course will pass the Chena Dome Trail Shelter before turning north and descending to the Upper Angel Creek Cabin. Departing the Upper Angel Creek Cabin the course will cross the Angel Creek Bridge and take the Angel Creek Hillside Trail to the Upper Angel Creek Trailhead at mile 50.5 Chena Hot Springs Rd. 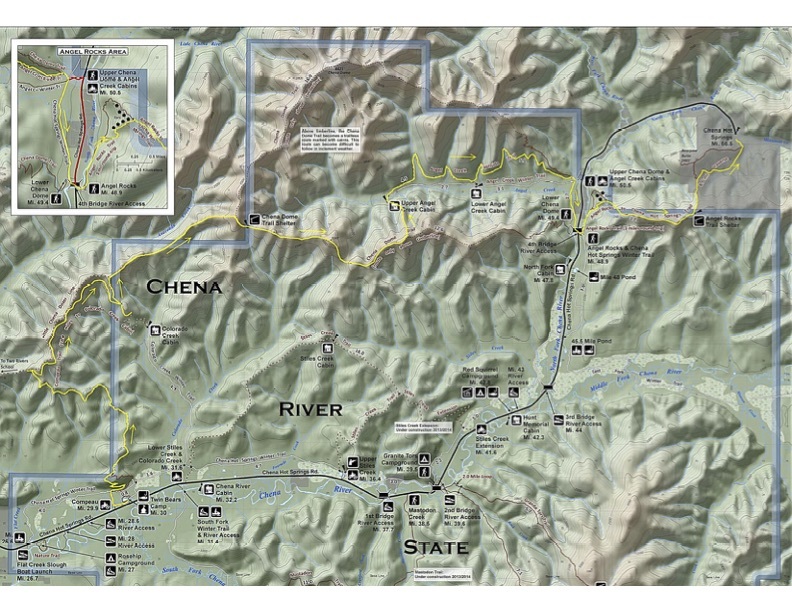 Depending on race day conditions the course will either follow the road approximately 2.0 miles south or take the winter trail that parallels the Chena Hot Springs Road to the Angel Rocks Trailhead at mile 48.9 Chena Hot Springs Road. 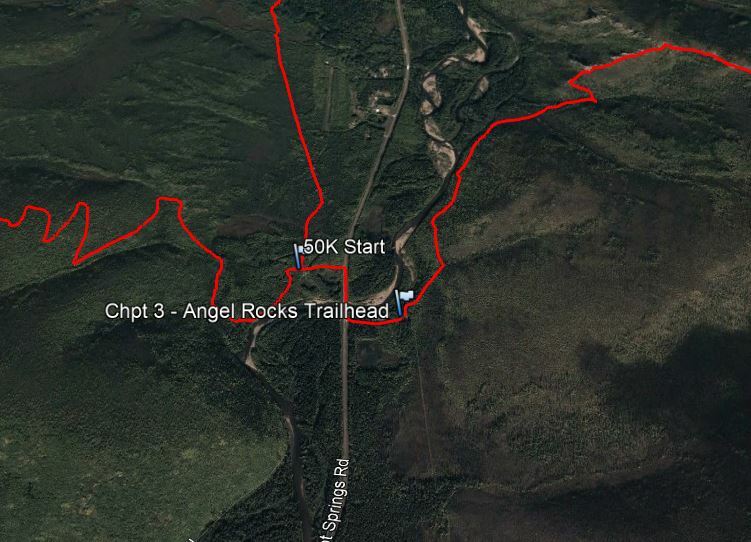 From the Angel Rocks Trailhead the course will traverse Angel Rocks, passing the Angel Rocks Trail Shelter, and finish at Chena Hot Springs Resort at mile 56.5 Chena Hot Springs Road. The course will be well-marked on race day, though taking a copy of the race map, particularly if you’re not familiar with the area, is encouraged.